It's actually the biggest city in Spain, at a size of 607 km² (234.4 sq mi), right in the heart of the Iberian Peninsula. Madrid is the third-largest city in Europe after London and Berlin. There's 3.26million Madrileños in the capital of Spain. You’ll have to brush up on your Spanish and order some Euro (unless you’re European of course). What are Madrid's top attractions? Madrid is known for being a great cultural and artistic centre and this is reflected in the following triad of world-famous art museums, located within a stone's throw of one another: The Museum Del Prado (Paseo del Prado) is home to one of the finest art collections in the world, including many of Spain’s most famous classical pieces. This huge museum boasts works by Rembrandt, Goya, Titian, Botticelli, Caravaggio, Dürer…and many more! Open Mon – Sat from 10am – 8pm, Sundays and holidays 10am – 7pm; admission €12. Free entry Mon – Sat from 6pm – 8pm and Sundays and holiday from 5pm – 7pm. Reina Sofía National Museum (C/ Santa Isabel 52) houses Madrid's collection of modern art including Man Ray's 'Indestructible Object' and many of Pablo Picasso's most revered pieces like his famous 'Guernica'. Open Mon – Sat, 10am – 9pm, Sundays 10am – 7pm, closed Tuesdays; admission €6. Free after 7pm Mon – Fri, after 2.30pm on Saturdays and all day on Sundays. Thyssen-Bornemisza Museum (Paseo del Prado, 8) is where you’ll see works by Monet, Degas, Renoir, Picasso and Van Gogh among others. Open Tues – Sun, 10am – 7pm; admission €9. Other than Museums, what else is there to do? Where to begin?! The breathtaking Palacio Real (Royal Palace) is the official residence of the King of Spain and is the largest royal palace in Western Europe, with over 2,800 rooms. Certain sections (50 rooms) are open to tourists except for when there’s official business taking place. 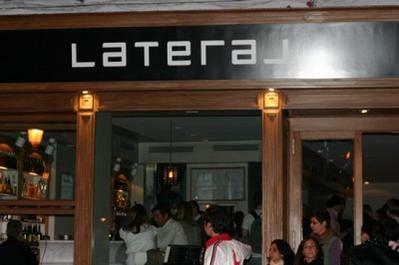 Located in downtown Madrid, it’s accessible from the Ópera metro station. Also, The Almudena Cathedral is located behind the palace and is well worth checking out. If you really want to soak up the atmosphere of Madrid then you can’t do much better than sitting down in one of the city's numerous plazas, ordering some light lunch and watching the city buzz around you. Like most of Europes major cities, a great café culture exists here so make sure you experience it! Plaza Mayor has lots of cafés to choose from. And Puerta del Sol and Plaza Espana are great for sitting by fountains or on park benches. 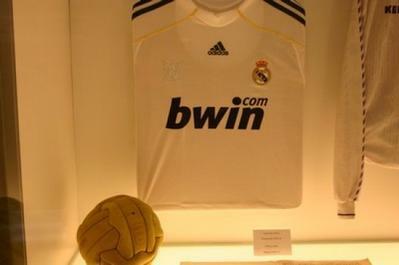 As for sport, the city has two main football teams, each with very differing histories. 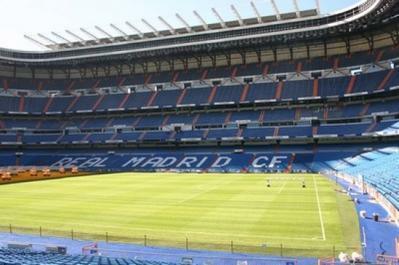 Real Madrid are one of the world's most famous and successful teams and play in front of 80,000 fans in the amazing Estadio Santiago Bernabéu. 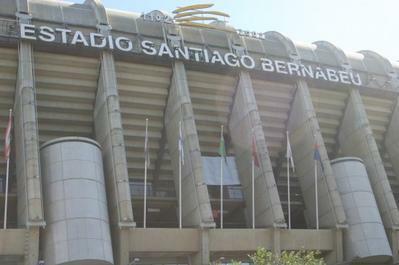 The other team is Atlético Madrid, seemingly forever living in Real Madrid's shadow but boasting a passionate following that pack the 60,000-seat Estadio Vicente Calderón. Dotted around the city are some immaculate gardens and parks, most of which are free to visit. Madrid can get extremely warm so taking a break every now and then from the buzz of the streets is a must and parks such as the Campo del Moro provide the perfect location for a midday picnic! 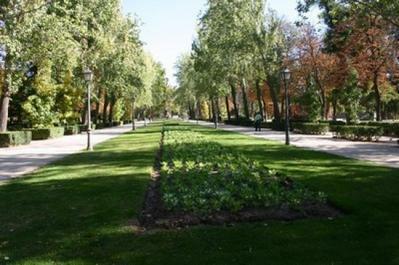 Close to the Museum del Prado you can also find what is probably the city's most popular park, the Parque del Buen Retiro. 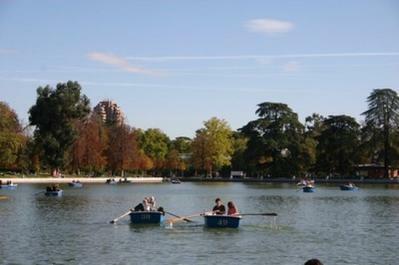 Here you can find many gardens, fountains, monuments, a little lake with row boats and the Palacio de Cristal. And don't forget about the Real Jardin Botánico (Botanical Gardens) where all kinds of botanical life are on show. Where can you find most of Madrid’s bars? North of Gran Vía is Chueca, the city's gay district and home to a ton of hip, stylish bars with interesting decor and cheap, tasty tapas. Cava Baja is also lined with bars which are a good mix of locals and tourists. 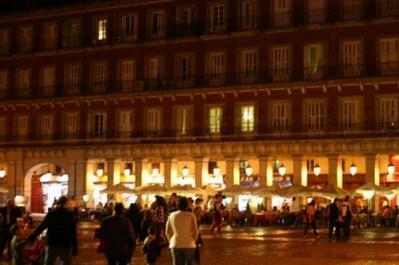 The city's large squares are also popular centres for night owls and the Plaza de Santa Ana, with bars such as Cervecería Alemana and La Moderna, is a great place to start the night. 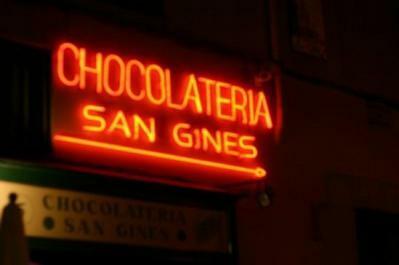 Just around the corner there’s Calle de las Huertas, packed with many more late-night joints. If you’re feeling up for it, and would like to see as much of the city's nightlife as possible, then you could partake in a Madrid pub crawl. 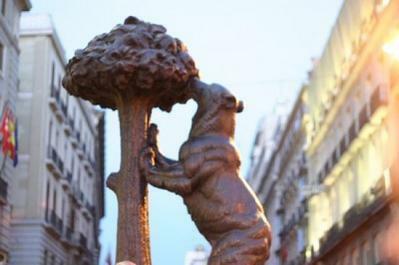 One of the best is called MADride Pub Crawl and leaves from ‘The Bear’ statue in Puerta del Sol every Wednesday and Sunday at 23:00. What about clubs? Madrid is know as a location for some wild nights out. Madrid’s nightlife is legendary so don’t expect to keep up with the locals without some training in advance! Once the bars are winding down, the perfect place to round off the night is at one of Madrid’s nightclubs. Kapital (c/Atocha, 125) is one of your best options. Spanning seven floors, and with a huge variety of music from dance to salsa to a karaoke floor, you’ll happily dance into the wee hours of the morning. Joy Eslava on Calle Arenal is also a hugely popular tourist option. But if huge clubs are not your thing and you would prefer something a little bit smaller but just as fun, then keep a look out for the many late-night clubs that are dotted around the city alongside the bars. Most will have a cover charge but this normally comes with a voucher for a free drink. Is there anything to do which is not alcohol-related? There is the usual array of theatre, opera and other entertainment, but for a real taste of Spanish culture there is Las Ventas, Spain's largest bullring. Bullfighting season lasts from March to October and bullfights are usually on every Sunday. Out-of-season, the arena is used for music events and seats 25,000 spectators. A night out in Madrid starts late and then just keeps going! Most bars are deserted before midnight and stay open until about 03:00. Clubs will only start to get busy around that time, with doors closing between 06:00 and 08:00. In short; the youth of Madrid aren’t too fond of sleeping. Drinking on the streets is illegal and it’s advisable to always carry some form of ID with you for entry into bars and clubs. Is it expensive to eat out in Madrid? The city is a huge tourist destination so make sure to shop around and try not to eat in central Madrid (Plaza Mayor and Plaza Santa Ana) as prices do tend to be inflated and lacking in quality. What types of restaurants can I expect to find? Like most of Europe’s major cities, Madrid is home to a very broad spectrum of international cuisines. 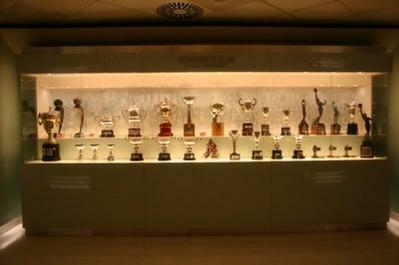 However, it also retains a very Spanish core, full of wonderful seafood and, of course, tapas. Madrid is known for its meat dishes - understandable given its location - and menus are dominated by ham, beef and pork. These dishes can be a little heavy, especially in warm weather, but you should try at least one during your visit. Ham in particular is very close to Madrileños' hearts and its quality and variations are treated very similarly to how the French view their wine. Beef should also be sampled as it is considered some of the best in the world, coming from free-range cows high in the mountains. Goodness, so much meat! What about vegetarians? Don't worry, there's a decent selection of vegetarian and vegan places in Madrid, too. One of the tastiest is Viva la Vida on Costanilla de San Andrés, serving a sizeable buffet in a relaxing, garden-style restaurant. Yerba Buena (3 C/ de Bordadores) is a cheerfully bright place with creative salads and a good range of veggie staples. In fact, there's around 10 vegetarian restaurants across the city centre so you shouldn't have too much trouble finding one. Tapas are a selection of small savoury dishes that are either eaten on their own as a snack or collectively as a meal. Examples would be calamari (deep-fried squid), Spanish ham, sundried tomatoes, sardines, croquettes, meatballs, potatoes… the list goes on! Madrid is laced with tapas bars and prices start off at about €2.50. There are many tapas restaurants to choose from around the city, but if you are looking for a quick snack with a drink, then bear in mind that many bars serve tapas also and some give little plates of tapas free when you buy a drink. One of the most famous is El Tigre on Calle de las Infantas, where for the price of a beer (€2.50) you get a sizeable plate of tapas. What times do restaurants serve? As with the rest of Spain, dining times are very particular. 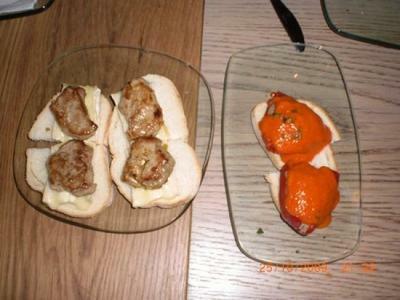 Lunch is served from 13:00 to 15:00 and dinner doesn’t begin until 21:00. If you stick to these times and avoid tourist-focused restaurants that may open earlier you’ll be rewarded with a far greater selection of dishes. For snacks during the day you can always go to a generic fast food chain but our advice would be to find a supermarket and stock up on some fresh, healthy snacks! This may come as a surprise, considering its landlocked location, but Madrid is also considered the 'Best port is Spain', with the finest selection of seafood anywhere in the country. The age-old need to supply fresh produce to the capital lives on and many consider Madrid to be home to the best seafood in Europe. 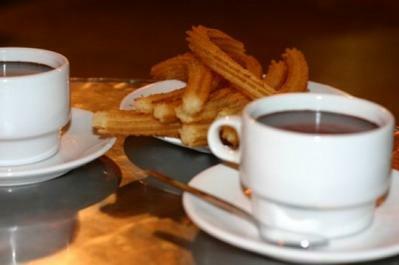 And for dessert, don't forget to try the Madrid speciality of churros and chocolate! 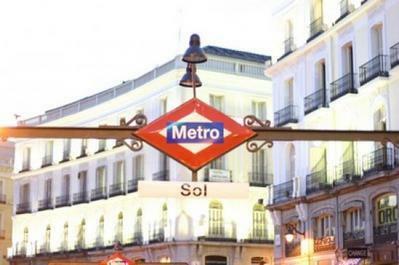 The metro is the way to go for two reasons; the first being that it is a very efficient system and the second is that it means you get to escape the Madrid sun for a short time! Single journey tickets will cost you €1.50. If you’re planning on using a lot of public transport then you should think about getting a Metrobús ticket, giving 10 rides for €12, which is valid on both metro and bus (the red buses only!). Pick up a Metro map on arrival and you'll have no trouble finding your way around the city. Here are our suggestions of five free things to do in Madrid so you can enjoy this great city while sticking to your budget. 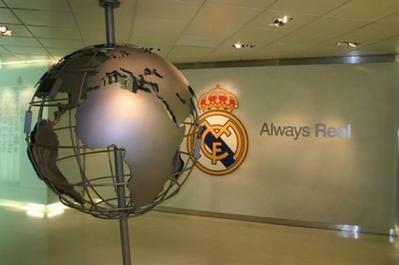 Madrid is the capital of Spain and it also lies right at the centre of the country. There is a lot to see and do all over Madrid, but if you are on a budget here's Hostels.com 5 Free Things to do in Madrid. 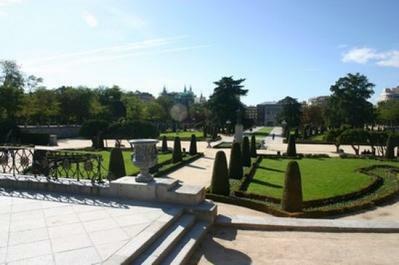 Madrid’s Parque del Buen Retiro is the main park of Madrid. Buen Retiro Park is a very large, popular park that lies at the edge of the city centre not too far from the Prado museum. It is filled with amazing sculptures and monuments, a beautiful lake where you can row boats, and gardens that are lined with trees and walkways. 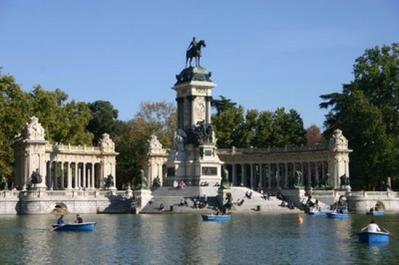 Retiro Park is popular with both locals and tourists and makes for an ideal retreat from the city centre. 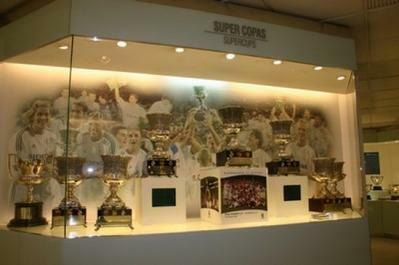 Madrid is renowned for its art and culture and is home to some world class museums. Museums and galleries are in abundance all over Madrid, many of which are free; but the bigger museums do charge an admission fee. 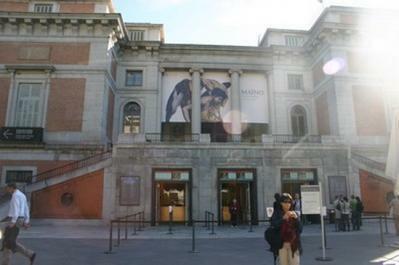 The two most popular museums in Madrid are the Pra-do Museum and the Reina Sofia Museum as they are home to some of the world’s most famous artists. These two museums do offer free admission at certain times so check out what days this free admission applies to before you visit. A great free thing to do in Madrid is to walk around the area where the Temple of Debod now resides. This is an Egyptian Temple that was rebuilt in Madrid after the Egyptian state donated it to the city when they had to move some of their monuments. 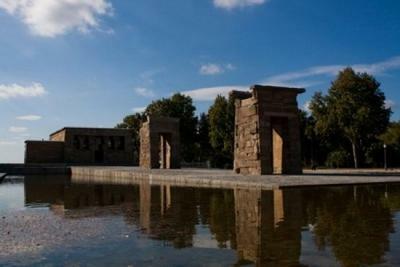 Temple of Debod was rebuilt in one of Spain’s most beautiful parks – the Parque del Oeste. It is one of very few works of ancient Egyptian architecture that can be seen outside of Egypt. Normally the only time you want to see a train station on your trip is when you are entering or leaving the destination. 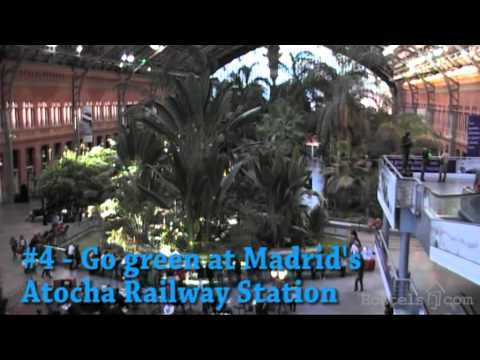 However, a visit to Madrid’s A-totcha railway station is a must in order to see an indoor tropical garden! The tropical garden can be found in the ‘old’ A-totcha Station building as this was turned into a rest area when the entire station was renovated and expanded in 1985. You can walk through the mini forest and don’t forget to visit the turtles who reside there also! Madrid is made up of many Plaza’s or squares. 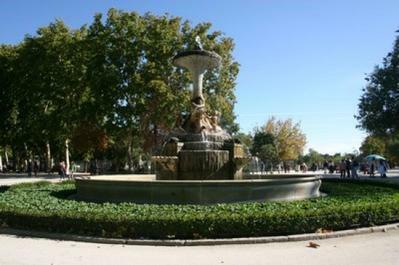 In the city centre you will find a lot of squares as they are popular hangouts for tourists and locals who sit amongst the statues and fountains. 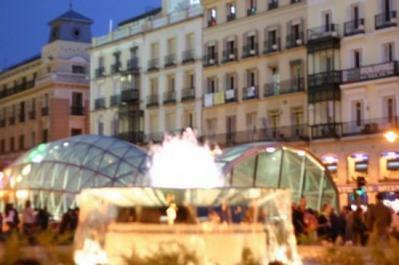 Some of these popular city squares include Puerta del Sol where people sit by fountains and watch the street performers. Plaza Mayor is another very popular Madrid square where you will find yourself enclosed by some stunning Spanish architecture. Plaza de Mayor has many restaurants, cafes and street performers also. Plaza de Espana is also worth a visit to check out some great sculptures and makes for some great photo ops too! 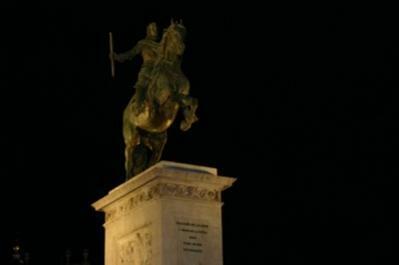 Pablo Bautista from Promocion Madrid talks to Tracy Lynch about Madrid's tourism, art and culture and what lies ahead for the Spanish capital city. One of our favourite things to do in Madrid is not to sit out in the various city squares and people watch, or hit Retiro Park on a sunny afternoon... it's eating! 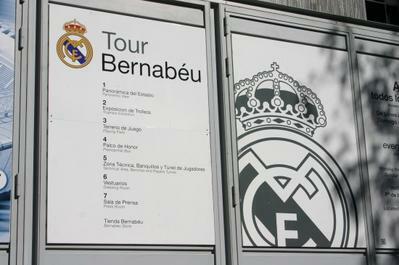 Madrid is renowned as a city full of art and culture. Some of the world’s most famous artists can be found adorning the walls and open spaces of the Spanish capital city’s museums.